Over the last few years, many young adult books have been pitched by hopeful publishers as "Margaret Atwood for teenagers." These comparisons seem to be raised at the slightest presence of feminist subtext or sexual subjugation in a dystopian novel, but few—including Lauren DeStefano's 2011 novel Wither , or Gennifer Albin's much-heralded Crewel (2012)—manage to incorporate either the depths of Atwood's political commentary or the rank body horror of The Handmaid's Tale (1985). Perhaps that's too high a bar; few authors are capable of Atwood's complex and strikingly real worldbuilding, much less the sophistication of her critique of both the patriarchy and the religious institutions that support it. But Mandy Hager's The Crossing , first published in 2009 by Random House New Zealand and rereleased in the States last month by Pyr, comes closest. Conceptually, it flies in much the same manner as Atwood's dystopian classic. And yet Hager's novel proves that conceptual similarity to a classic is not nearly enough. Hager's framework is compelling. The Crossing is the story of Maryam, a diminutive young Sister on the island of Onewere. 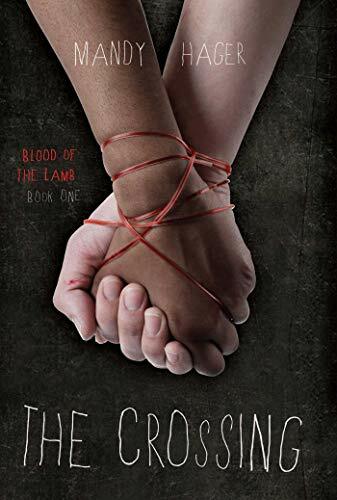 Raised by the Blessed Sisters for life in the Holy City—an abandoned cruise ship—Maryam soon learns that the Apostles of the Lamb are far more interested in the bodies of the young women who serve them than the salvation of their souls. Maryam's blood is tested for a clotting factor, and when it's found to be satisfactory, she's slated to be used as a "bleeder"—blood donor—rather than a "breeder" like the other girls. When the last of the villagers had also filed up to accept the gift of Blood and returned to their seats, he turned his attention directly back to her. "Will you, Sister Maryam, who are meek and lowly in heart, be gentle and unresisting as our sweet Lamb, all the time surrendering your will to the Holy Fathers who have blessed us with their presence and worked with the Lord to save us from the Tribulation's wrath?" But Maryam eventually realizes that she is, in fact, in great trouble as she acclimates to life on board the Star of the Sea. She comes to the conclusion that God is a force for pure evil (and no wonder, given the religious figureheads who surround her). And while the Apostles who manipulate her life are compelling villains, they're not quite believable people. In this respect, The Crossing suffers in comparison to The Handmaid's Tale ; at no point are we given a character as complex as Serena Joy—certainly villainous, but in ways sympathetic, just as much a victim as our protagonist. Instead, Maryam is plunged into a world of black and white morality with no acknowledgment of shades of gray. Underscoring this moral simplicity is the simplicity of the characters of the novel. Maryam is not a weak character in the sense that she is "not strong"—she protags when she needs to protag and schemes against her captors quite effectively. But she's not particularly well-drawn either. Rather, she's primarily defined by her appearance (her small size, which has her nicknamed "te bebi" by the Sisters who raised her) and by her sliding scale of religious beliefs. Maryam's growing skepticism is also fairly flat ("She was no longer concerned that maybe she'd offend the Lord. He either condoned these evil acts—in which cast He was evil too . . . or else He was merely a myth" [p. 168-9]) and therefore not particularly compelling. "There is something in you, Sister, that shines past the haze that blinds me. Look into my eyes and just relax—show me what is in your heart." She stared up, unsure what it was he wanted from her. But she felt compelled, her heart speeding. The old man's eyes looked as though a cloud had crossed the sun; a strange light still seemed to emit some warmth. How terrible, she thought, to lose the gift of sight. To never see the sun set coral pink against a glassy sea, or the bright bursts of color when the flowers bloomed in the jungle. How achingly sad, never to look upon the faces of those you love. The idea that the disabled somehow gain the gifts of supernatural insight and kindness—which are then used to only benefit the able-bodied on their more important life journeys—is a woefully dated trope. It's bad enough when Stephen King does it; I had little tolerance for it here, particularly when it's used to move much of the plot. And the plot trudges on, despite the flat characters and the extremely mannered, overwrought prose ("She knelt, careful to keep the water from her wound, then slowly swam out through the gentle waves and floated on the crystal surface, with the sun shining golden pink through her closed eyelids and her thoughts stilled and silenced by the steady whisper of the sea" [p. 185]). There's little joy in any of this—or sense of identification, adventure, or discovery, even as the novel's conclusion sets up the series to delve into the wider landscape of Hager's world. Readers both old and young would be better off sticking with Atwood's classic. It's not only more thoughtful, but also considerably more entertaining.